My handwash liquid states that it kills 99.9% of bacteria. This usually comes with a disclaimer at the back: "based on laboratory tests". First of all, if I make a handwash, I would certainly like it to have this attribute too. One way is to lie and simply add this (now) ubiquitous phrase (which probably nobody cares anymore). Alternatively, I would actually perform some tests. Yet, these tests do not need to be peer reviewed in any sense, and hence I just need some basic, quick test that can be designed to prove the point. I doubt these tests are actually carried out. There is no incentive for companies to do so, probably because very few consumers really care about this. In my opinion the 99.9% (instead of 100%) is just a way for these companies to avoid any legal consequence for cases in which some bacterias are not removed by the product. Maybe some of you do know more about this? Is this just unscientific advertising? Many of these products have marketing statements that say the product “kills 99.9% of germs*.” However, somewhere on the container in small print is the list of germs it actually kills, and this list of germs may or may not include some or all of the Influenza viruses. When a marketing claim of “kills 99.9% of germs” is used, it may or may not kill the specific variety of bacteria or pathogen you need killed. By law, disinfectants must list the microorganisms which a product has been tested for and found to be effective against on their label, as well as proper dilution and directions for use. Check the label for the specific pathogens you need protection from. So - they may only test on a couple of strains of germs, and claim it kills 99.9% of them. 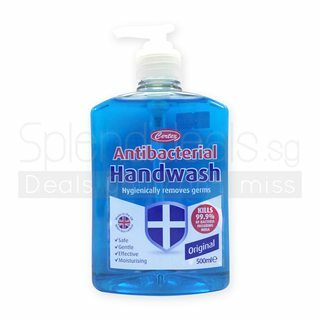 There are also other "get-outs" for manufacturers of disinfectants and soaps - such as there being no upper limit to the time taken to kill all those germs. Most disinfectants need a contact time of 10-30 minutes to properly disinfect a surface - the 10-20 seconds on your hand before rinsing just isn't the same. That said - don't stop using soap - because some disinfection is better than no disinfection, but the home disinfectants aren't any better than regular soap for handwashing. The stuff they have in hospitals is a bit harsher, though. Answering mainly: "Is this just unscientific advertising?" The main effect of a handwash is that it washes away the bacteria/germs. Water, especially warm and hot water does its own thing to remove them, a soap-like substance adds to this effect and so is a towel. The added ingredients that qualify for the 99ish%-label are just icing on the cake. None of the above methods I listed will so much kill but remove bacteria or dilute them in the sense of reducing their numbers. None of the advertised substances added to such washes will kill all of the bacteria. As long as you are not ill and required to live as sterile as possible that is a good thing. You are yourself a living being. Sounds like a fun fact but is meant to convey that "a human" might have different definitions now than a few decades ago. Not all bacteria are harmful. Most of them are not. Many of them are actually beneficial or even needed, like those in your gut. While gut bacteria might have quite a good reputation by now, those on your skin, that those handwashes would like to kill are only slowly getting a better stand. Everyone lives in a symbiosis with their individual microbiome. Sanitation at least disrupts this balance. Costs and benefit should be carefully calculated. These labels certainly do not do that. It is therefore quite important to qualify this kind of advertising as scientifically incomplete, if it is directed at the general public. Scientists and the medical practitioners as well as the ill do not need any advertising at all. They need robust information. Normal handwash is usually (more than) enough. It is not possible to really sterilise everything completely, nor would that be desirable. Add to that the effects of evolution: Consider that the tests you question really are carried out. What does that mean in the slightly longer term? In using them you create an environment on your skin where the pressure to adapt is directed towards resisting the chemicals used in that handwash. According to the label, 0.1% of all bacteria survive this attack. Compare that to their phenomenal ability to multiply and overcome chemical onslaughts with for example antibiotics. This leads to the situation that you un-train your own immune system to deal with any bacteria and disrupt the workings of the good bacteria your microbiome needs or can tolerate. Indiscriminate killing also tends to have the very unwelcome side effect of giving just the most harmful bacteria an edge in the fight for survival. As advertising goes, these big label numbers are abuse of science, fear mongering and a generally misleading disservice. Not the answer you're looking for? Browse other questions tagged consumer-products hygiene advertising . Do Ultra-violet LEDs on air hand dryers help to kill bacteria?